The podcast returns – we love the talkies don’t we? This time around, I’m lucky enough to be joined by Matthew Turner from viewlondon.co.uk and podcaster extraordinaire Pete Baran. We’ll be hearing what you thought of the recent British Silent Film Festival, anticipating the forthcoming silent Hitchcock screenings in London and Matthew will be talking about his favourite silent film. 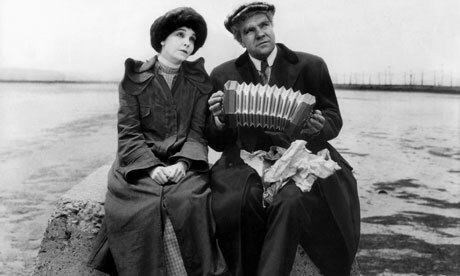 If you haven’t seen Greed (1924), be warned: here be spoilers. There is plenty of suspense, however, in discovering whether we fail The Artist Challenge – and if we do, who the culprit will be. The Silent London Podcast is also on iTunes. Click here for more details. The music is by kind permission of Neil Brand, and the podcast is presented in association with SOAS radio. If you want to get in touch with us about anything you hear on the podcast, email silentlondonpodcast@gmail.com, tweet @silent_london or leave a message on the Facebook page: facebook.com/silentlondon. I really enjoy your podcasts, even though there’s only two of them 🙂 You have a pleasant radio voice! When’s the next one coming? Thank you! The next one should be early July and it will be a comedy special. Hope you like it!